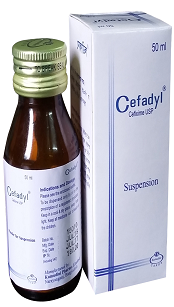 Cefadyl 200 Capsule Each capsule contains Cefixime Trihydrate USP equivalent to Cefixime 200 mg.
Cefadyl 400 Capsule Each capsule contains Cefixime Trihydrate USP equivalent to Cefixime 400 mg.
Paediatric Drops Each ml reconstituted suspension contains Cefixime Trihydrate USP 27.98 mg. equivalent to Cefixime 25 mg.
Cefadyl Powder for Suspension After reconstitution according to direction, each 5 ml suspension contains Cefixime Trihydrate USP equivalent to Cefixime 100 mg.
Cefixime is a semi-synthetic, broad spectrum cephalosporin antibiotic for third generation for oral administration. It is a bactericidal antibiotic, kills bacteria by interfering in the synthesis of the bacterial cell wall. Cefixime is highly stable in the presence of beta-lactamase enzymes. Cefixime has marked in-vitro bactericidal activity against a wide variety of Gram-positive and Gram-negative organisms including beta-lactamase producers. Clinical efficacy of Cefixime has been demonstrated in infections caused by commonly occurring pathogens including Gram-positive organism Streptococcus pneumonia, Streptococcus pyogenes, Gram-negative organisms Escherichia coli, Proteus nirabilis, Klebsiella spp., Haemophilus influenza(beta-lactamase positive and negative), Moraxella catarrhalis (beta-lactamase positive and negative), Salmonella typhi and Enterobacter species. Cefixime is generally well tolerated. The majority of adverse reactions observed in clinical trials are mild and self-limiting in nature. Gastro-intestinal disturbance: Diarrhea (if severe diarrhea occurs, Cefixime should be discontinued), changes in the color of stool, nausea, abdominal pain, dyspepsia, vomiting and flatulence have been reported. Others: Hypersensitivity reactions which usually subside upon discontinuation of therapy; infrequent and reversible hematological changes; elevation of serum amylase. Cefixime should be prescribed with caution in individuals with a history of gastrointestinal diseases, particularly colitis. Dosage adjustment is only necessary in severe renal failure (creatinine clearance < 20 ml/min). Patients with known hypersensitivity to Cefixime or cephalosporin group of drugs. Carbamazepine: Elevated carbamazepine levels have been reported in postmarketing experience when Cefixime is administered concomitantantly. Drug monitoring may be of assistance in detecting alterations in carbamazepine plasma concentrations. Warfarin and Anticoagulants: Increased prothombin time, with or without clinical bleeding, has been reported when Cefixime is administered concomitantly.